As the first woman to receive a scholarship to the Cincinnati Art Academy in 1904, Maude Kaufman Eggemeyer established herself both artistically and historically. She is known for her tranquil depictions in both the garden landscape and floral still life. A brilliant colorist, she was one of the leading women artists of the State of Indiana and has had her work exhibited all over the United States. Born in New Castle, Indiana the daughter of a well-known architect, she studied at Earlham College, Richmond and with Hoosier artists John Elwood Bundy and J. Ottis Adams. 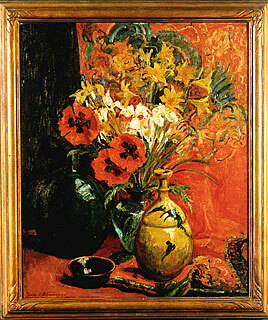 A founder of the Richmond Palette Club, Mrs. Eggemeyer exhibited in Art Association of Richmond’s Annual Exhibition, John Herron Art Institute, Cincinnati Art Academy, the Hoosier Salon and the Brooklyn Museum of Fine Arts, New York. Mrs. Eggemeyer traveled extensively to paint gardens, including the gardens of prominent Dayton, Ohio families, Mrs. Fred Rike and Mrs. Robert Patterson. Equally adept at portraiture, she painted several Richmond notables including Ellen Bartel. Her work has gained significant recognition of late, bringing record prices at auction. Richmond-Item, July 10, 1931. Mrs. Maud Kauffman Eggemeyer Lauded by French Art Journal. 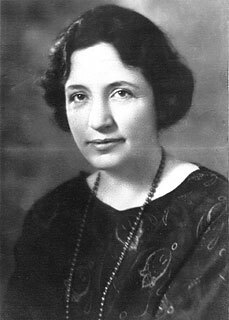 Burnet, Mary Q. Art and Artists of Indiana. New York; The Century Co., 1921. Newton, Judith Vale and Carol Weiss, A Grand Tradition: The Art and Artists of the Hoosier Salon, 1925-1990. Indianapolis, Indiana: Hoosier Salon Patrons Association, Inc., 1993.